Considering I’ve lost a good number of votes already due to random dumb reasons, I’ll be signing up. 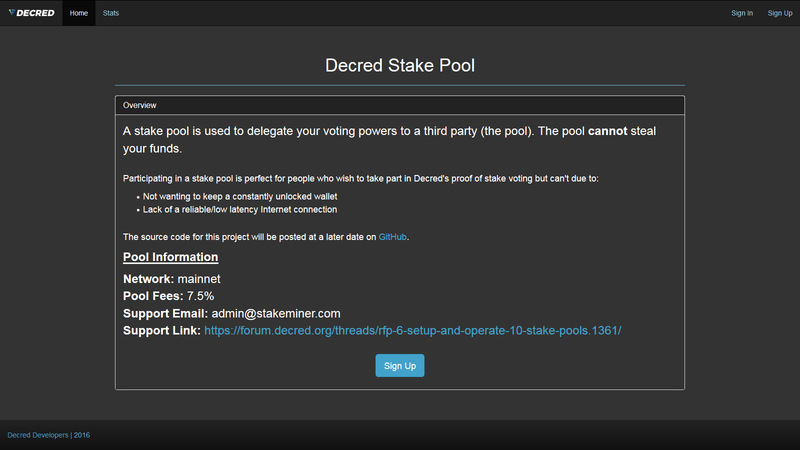 I missed the main Decred pool when it came out (didn’t sign up because I didn’t have enough coins). I’m assuming they are more redundant than my wallet at home considering the fee, which would be worth it to me. The way that staking works with Decred is different than with most other PoS coins, so there is no fixed yearly interest rate. I am one of the pool operators of dcrstats stakepool. Feel free to ask any questions via email. I hope people like the design, please add our stakepool to the list.